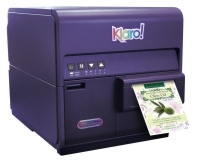 Replacing a single printhead in your Kiaro! How to unpack the Kiaro! How to install the Ink Cartridges in the Kiaro! How to Install a Roll of Gap Labels in the Kiaro! How to Install a Roll of Black Mark or Cue Bar Labels in the Kiaro!